For those of you unaware, and clearly living under a culturally oppressive rock, Mission Creek Festival begins next week right here in Iowa City. Mission Creek takes place the first week of April every year (the 1st-6th), and brings music, food, lit, and film fans from all over the country to Iowa. 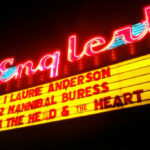 This year will be no exception, with indie headliners such as Warpaint, The Head and the Heart, !! !, and Kishi Bashi. The indie folk group’s show at the Englert Theatre Friday, April 4th is sold out, so if you’re lucky enough to come across someone with extra tickets, thank your lucky stars. The Head and the Heart have been on indie fast-track since their debut self-titled album was released in 2010. With the release of their new album, Let’s Be Still last year, THATH have grabbed some serious attention, booking not only Bonnaroo and Lollapalooza, but also Coachella, the Governor’s Ball, and world famous Milwaukee Summerfest. Check out the official music video for their single off Let’s Be Still, “Shake”. Fresh off his set at SXSW in Austin and the Middle of the Map music festival in Kansas City just before Mission Creek, Kishi Bashi’s show at The Mill on Friday, April 4th should be an excellent one. With praise like World Rock Magazine‘s stating, ““. . . if God had an iPod, he’d be listening to Kishi Bashi.”, one can only expect a beautiful set from the 38 year-old Seattle native, who is also a member of the group, Of Montreal, who also headlines Mission Creek, (Thursday, April 3rd at Blue Moose Tap house). Check out the brand new official music video for “Philosophize In It! Chemicalize With It!” of his upcoming album Lighght. The Mission Creek comedic headliner is a former writer for NBC’s Saturday Night Live, currently stars in the Adult Swim faux-talk show The Eric Andre Show, has a set at Bonnaroo, and is a returning cast member of the new Comedy Central series Broad City. Buress’ show Wednesday, April 2nd at the Englert Theatre will leave you with sore abs and a smile on your face. Check out his hilarious set about New Orleans on The Tonight Show With Jimmy Fallon last month. The indie rock, all female group will be playing the opening night of Mission Creek, Tuesday, April 1st at Gabe’s. Much like The Head and the Heart, Warpaint has booked an impressive amount of spring and summer festivals, Snowball, Bonnaroo, Lollapalooza, Coachella, Boston Calling, Pickathon just to name a handful. The group has been together since 2004, and has three successful full length albums. Their newest album is self-titled, and was released in January. Check out their live performance of “Elephant” from their debut 2009 album, “Exquisite Corpse”, at PitchFork music festival in Paris last December. While she’s not a headliner, Caroline Smith will be soon enough with her smooth and soulful voice. Smith will be on at 11pm just before !!! at Gabe’s on Friday, April 3rd. Her pure talent and flawless voice is something you cannot miss at Mission Creek this year. You can also catch Smith at the Middle of the Map festival in Kansas City. Check out the music video for the song “Magazine” off of Caroline Smith’s 2013 album, Half About Being a Woman. For a full Mission Creek 2014 calendar of events and ticket information go to Mission Creek’s website.